If the truth is to be told, this column was the idea of Dr. Meat. He lives a very obscure life, with a rather beefy wife and a dozen children from several different marriages. His sad existence is passing him by without any minutes of fame. This Web Page was his chance to get published, to be known outside his small (very small) circle of friends. This is his chance as he says, "to be somebody." Knowing that this may be his only hope at immortality, I have allowed him to call the shots at our hamburger restaurants visitations. But last week when he came up to me with his hometown, Port Washington Wisconsin, fish eating grin and wanted to dine at Denny's, I had to lay the smack down and say NO!!!! It was time for me to open his blue collar mind, and push these reviews to a new level. I have to admit that I was a bit embarrassed when we pulled up to Il Forno Classico in Dr. Meat's '86 primer colored Yugo. But since he pays for my meals as appreciation for the guidance I provide him, I just lowered my head and hoped nobody recognized me. Il Forno Classico is a nice little lunch cafe with a Southern Italian decor that reminds me of quaint restaurants found on the northern beaches on Malta. Dr. Meat found it a bit pretentious with tables full of Armani suits and $45 haircuts, and bleach blond, forty year old, tan women with push up bras and tight black pants looking for single Intel engineers. He also was a bit bedazzled when confronted with white linen napkins, three pronged forks, china and a table full of wine and water glasses. We both ordered the Certified Angus Cheeseburger with fries, and at $7.95, it is not out of line from many gourmet hamburger establishments. The meal was elegantly served; the burger was cut in half and held together with a long, fancy toothpick. The patty was one-third pound of fresh ground Angus beef, lightly seasoned and grilled over an open wood flame, giving it a natural smoke flavor. Even though we ordered them medium, they were slightly overcooked and a tad dry. Atop our burger was a generous slab of melted and spicy Sonoma jack cheese. The condiments were first class: an array of mixed greens, sliced Roma tomatoes, and lightly sautéed red onions. The sauce was a house made sweet honey-mustard dressing which pulled the whole creation together. The highlight of this sandwich was the homemade Italian style bun. It was perfect -- fresh, crisp on the outside and chewy on the inside. It had a slight yeast flavor, and I could easily order it by itself and eat it as a meal. It would have been an almost perfect meal except for the fries. Dr. Meat swore to me that he saw a waiter run across the street to McDonalds and empty a couple of bags of their fast food, frozen fries on our plates. He may have been mistaken, but it was very disappointing, and the chefs at the restaurant must have been ashamed by the management, cost cutting maneuver because they placed small tins of catsup on our plates to add some flavor to these tasteless white sticks. This tactic would be akin to Morton's of Chicago smothering their Salisbury Steak in A-1 Steak Sauce. It would be very difficult to find a better cheeseburger than what we found at Il Forno Classico, but the fries were definitely a fly in the soup. I would love to return, but we are still in search of that perfect burger-fries combination. 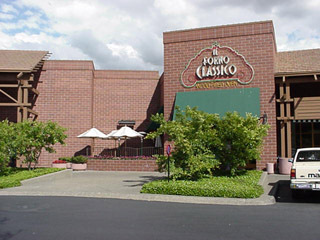 I felt we were jumping the gun when we chose to review IL Forno Classico in Gold River. All along we were educating you the reader in a progressive stepwise fashion. We took on the chains and the fastest food (AM/PM) joints first so we could establish a point of reference therefore, jumping up to a gourmet burger was impetuous for this grounded in logic writer. Entering "Forno" is a bit like walking into a theme based casino, you get the sense they were trying to set an exclusive ambience, in this case Tuscany meets Venice, but they don't quite achieve their goal. Maybe it was the fake (oops, I meant to say faux) palm trees, the hideous ceiling lights that resembled a Gahan Wilson drawing of a recently removed eyeball, or it was the garage sale quality stemware that was set out the table to impress the patrons. Actually some of this worked because my colleague and partner, Professor Burger, was the proverbial deer in the headlights when he saw more than one fork. As he proceeded to snap embarrassing photos of the table settings and the decor to send to the folks "back home", he kept saying, "now this is class". A smartly dressed waiter in a spotless apron dropped off the menus and took our drink order. My partner sampled the Coke fountain, and I tried their brewed iced tea. Although I prefer an ice cold Coca-Cola mixed to perfection, I also truly enjoy fresh brewed iced tea. None of that powdered trash, no sweeteners, and no fake lemon extracts. Just pure brewed or sun tea with a slice of tree ripened lemon. I was not disappointed, the tea was perfect. We ordered our burger, the only offering of the Great American Cuisine on the menu, and we proceeded to wait. As we waited I noticed the other tables were enjoying bread and butter at their tables. We waited some more and as I was on my third refill of delicious iced tea I was wondering where our food was. Did they have to run over to Bel Air and buy some ground chuck, did they have to relight the wood fired grill, or did they have a union established break? After thirty-five minutes of waiting the answer came to me on my plate; they went to McDonalds down the street to pick up some fries. The chefs were so embarrassed by their fries they placed a small bucket of catsup on the plate because they knew we would need it. We gave the fries a gift 12/25 points, I still feel it should have been less because this place is a lot more upscale therefore, it should have more effort in all aspects of the dining experience, but alas I could not get an intelligible response for Prof. Burger since he was still reeling from the whole "cloth napkin thing" (wait till Aunt Elmer-Jane and Uncle Cleetis and the rest of the holler hear about this). On the other hand the burger was absolutely fantastic. Thin sliced Roma tomatoes, red onion, mixed spring greens, honey mustard dressing, foccia style bun, with melted-gooey-pepper jack-cheese. The patty had that perfect texture, loose, but firm. It was seasoned and smoky from the wood fired grill. Although I had asked for medium, I received a patty that was obviously medium-well. Normally I would have sent it back but I did not have another 1/2 hour to kill. Let me say up front I don't go for the "foo foo" burgers typical of these establishments, but in this case I will make an exception. The honey mustard dressing was a pleasant contrast to the smoky oakness of the burger. The spring greens yield a dry finish to the palate that leaves the diner wanting more. The foccia bread bun held up and balanced the extreme flavors of the condiments into a symphony of tastes that were at once both profound and subtle. Believe me I was impressed. I will be back. Only this time without my doe-eyed partner, I realize he was a Marine but does he have to be such a Gomer? ?